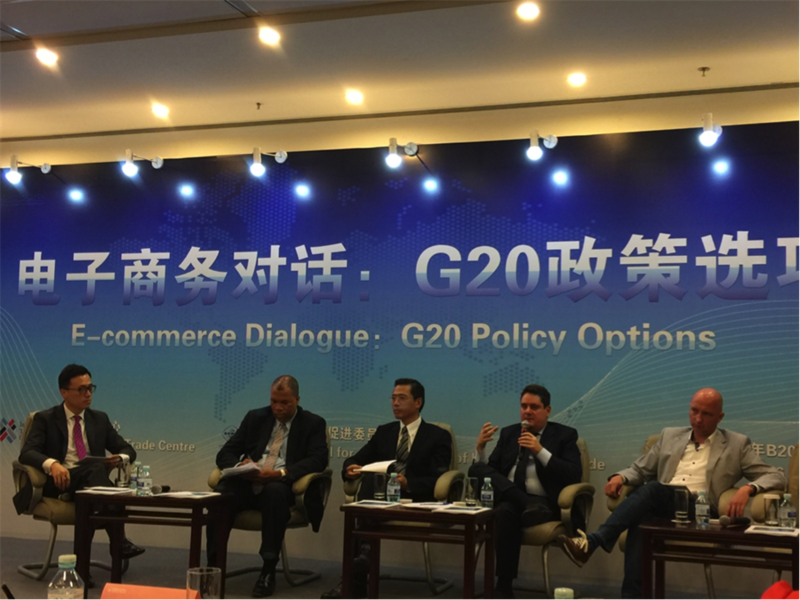 Putting e-commerce high on the agenda of the coming G-20 meeting was the objective of the “E-commerce Dialogue” forum held on 28th May at the China National Convention Center of Beijing. 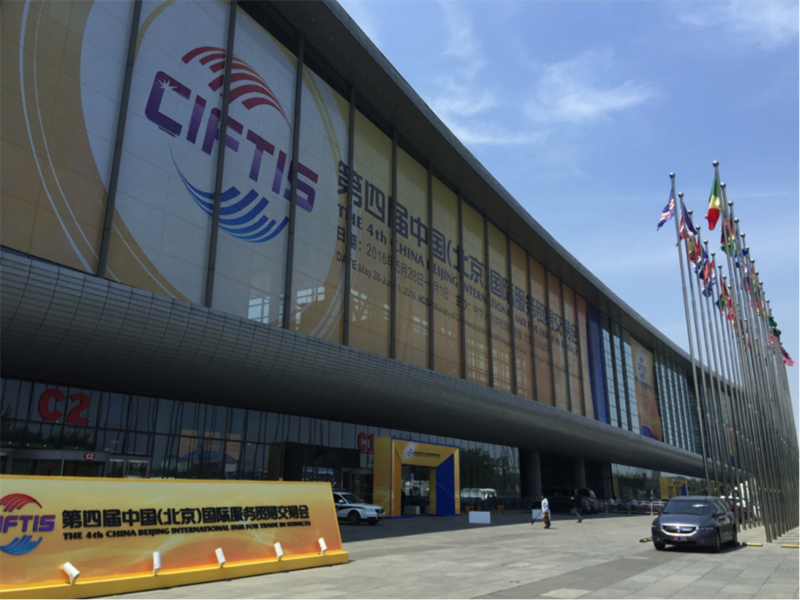 The forum was jointly organized by the International Trade Center (ITC), the China Council for the Promotion of International Trade (CCPIT) and B20 China, with the support of the World Trade Organization (WTO) and took place as part of the four-day flagship China International Fair for Trade in Services (CIFTIS). Convening the forum was one of the actions designed by the B20 SME Development Taskforce meeting, of which ChinaEU is a member, to bring together key industry stakeholders and mobilize them to put their weight to influence the preparatory discussions for the coming G20. Primary objective of the Taskforce, as highlighted in a previous briefing from Washington, is to shape concrete and workable recommendations to be endorsed by G20 governments to foster a more effective and efficient policy and business environment for cross-border electronic trade, which allows the de-facto participation of small and medium sized enterprises (SMEs). During the e-commerce dialogue, ITC formally disseminated its most recent report, entitled “Bringing SMEs on the E-commerce Highway”, available here, which provides an overview of the policy challenges faced by small firms in e-commerce, namely establishing online business, international e-payment, international delivery and aftersales, and offers a checklist for policy guidance. At the core of the discussions was the refinement of a concrete recommendation, last raised in Washington, to establish an Electronic World Trade Platform, or eWTP, a business-led mechanism to facilitate SMEs’ inclusion in global e-Trade. 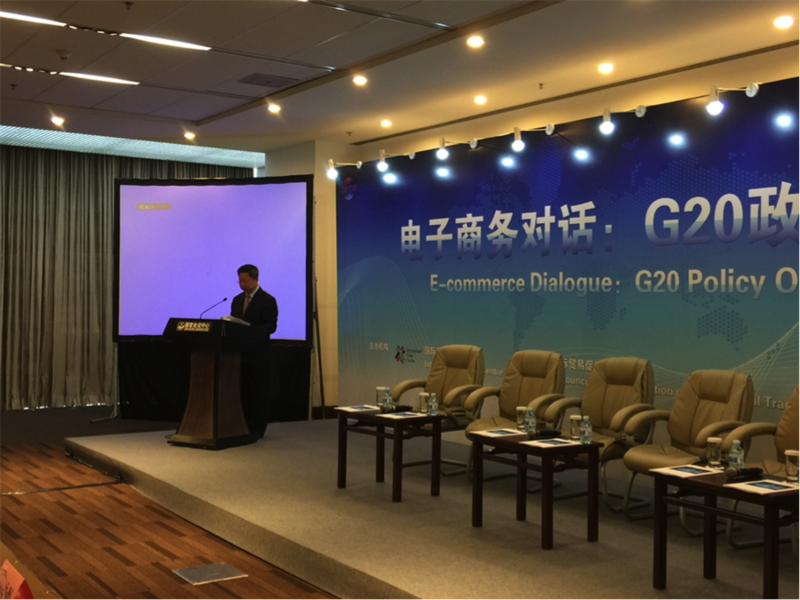 According to Yu Ping, Vice Chair & Sherpa of B20 China and Vice Chairman of CCPIT, eWTP will promote an open, transparent and multi-stakeholder public-private partnership on cross- border e-Trade. “CCPIT is committed to making eWTP a reality and will push Germany, Chair of B20 2017, to sustain this achievement next year”, he said. Shi Dongwei, Vice President of Alibaba, stressed the open and transparent nature of eWTP. “This is an SME-focused mechanism, which will coordinate input from and work with the relevant SME-focused and trade-focused international organizations such as WTO, ITC, UNCTAD, ICC, WCO, industry associations, consumer associations, academia, communities, governments and constituencies to assess and advocate conditions and incubate rules for the development of cross- border e-Trade, including both B2B and B2C”. Luigi Gambardella, President of ChinaEU, raised the attention to the fact that, while the industry has a leading role in setting policy recommendations, we should not forget the ultimate beneficiary of e-commerce, that is the consumers.“Instead of cross-border e-commerce, I would like to talk about e-commerce without borders. Our goal should be to give consumers freedom to shop online without limitations. As such it is of outmost importance that eWTP includes consumer associations as its main stakeholders”. “Next, we should be aware of what is happening outside. There is a general negative sentiment against anything that is global, against free trade. The public opinion is rejecting all treaties on trade. Our priority work should be to defend free trade and remind the public opinion of the enormous benefits generated by keep the market open and competitive,” warned Gambardella. Today, online consumers are oftentimes blocked from accessing offers in other countries, for example by re-routing the consumer back to a country-specific website, or asking to pay with a debit or credit card from a certain country. Such discriminations should be ended. Consumers and retailers should benefit from affordable deliveries and convenient return options even to and from peripheral regions. Consumers and small businesses complain that problems with parcel delivery, in particular high delivery charges in cross-border shipping and bureaucratic custom clearance procedures. Governments should assist international trade. Not restrict it! The idea of a top down harmonization of consumers’ rights (geo-blocking, after sales conditions, unfair commercial practices) may be an over-ambitious target to achieve at global level. We should trust more the stakeholders involved, such as Alibaba, to police their marketplace. International standards should be defined and governments’ role would be to certify that marketplaces comply with these standards.